The voice of Dixie just grabbed me and drew me into this story. Had I known how the story was going to unfold, maybe I would never have read this book, so I am very pleased I went in cold. 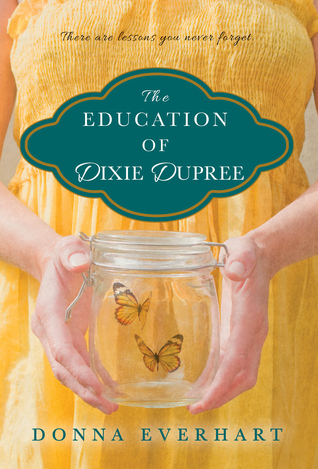 The Education of Dixie Dupree is the debut novel of Donna Everhart, yet it felt like to me that it was coming from a very experienced writer, it was so well written. Dixie is an inquisitive, strong personality and I was often horrified by the relationship she had with her mother. My heart went out to Dixie as she endured the many questions she had in her mind and the love and wonderings she had about her father. Her mother is a very unhappy woman and it could be said much of what happens, happens because of this unhappiness. Her secrets though are dark and as yet have not seen enough light. When something isn’t healed, then ugly things can result. Dixie keeps a diary and in it she writes her truths. Later this diary will become very important. However what she doesn’t know is her mother kept a diary like she did too, and eventually it will answer some of the questions Dixie has. Most of the story is set in Alabama and the setting – the heat, the red dust and the love of the land comes through from Dixie. What happens to Dixie is dark and abusive. This is not an easy book to read, but Dixie’s powerful voice just mesmerised me and kept me reading. And there is justice and hope and resilience. Perhaps the final revelation was a little ‘too tidy’, and I will be interested to see what others think about that. I've never really taken the time to consider reading a Southern Fiction. Hopefully this will be my first one! I love that cover, so beautiful. It sounds like it could be an interesting read, thanks for sharing! This one sounds like the kind of book I “enjoy,” in the sense that it resonates with me, and with what I've seen in my past career. I'm a “collector” of debut novels. I definitely will look into this one! I sense so much despair in your review. I have a really hard time reading novels that force young children to grow up too soon. I'm already protective of Dixie. To hear how exquisite her character is and her strong voice make makes me want to dive into her world and get to know her, too. Does not sound like an easy read. Especially when a child is involved.